Hey all, I was looking around for the best forums/community for my old Cannondale, and I think you guys will be the most helpful. A couple days ago I traded my Specalized hybrid for my friends Cannondale road bike. So far i have been very happy with it, gave it a good wash, and ride it to and from work about 5 says a week, about 3 miles away. And of course, here are the pictures, everyone likes pictures. So I have a few questions for you guys, being this is my first road bike and i cant say i know much of anything about working on it. First, does anyone know the specific model of this bike? I would like to look up the history and specs of it. I took it to the local shop and they recommended that I replace the chain and freewheel. I have never replaced these before. My guess is that the cheapest and easiest method for me is to buy the parts online, and have them replace/install them for me. I don't want to have to buy tools for something I will only do once. Its missing a chainring bolt, how do i go about finding the specific one i need? Besides that, i hope to learn more from this forum over the next few weeks. If you guys have any tips or suggestions, I'm all ears. Thanks all for reading and any help provided. Welcome to the forums! Cool bike to start with, I can't imagine a hybrid I'd like riding better than that. That enormous black dork disk is something I've never seen before, but I love dork disks, because I'm a dork. When the bike shop told you to replace the chain and freewheel, did they say why? Is it skipping when you pedal, or does it shift poorly or something? If not, don't be in any big hurry to change things around. Often, a hub made for 6 speeds can handle a 7. As an example, I just put one on my '85 Peugeot PH10, and it just squeaks in. It's usually a question of the slightly taller (deeper?) 7-speed freewheel not grinding its small cog on the stays. Sometimes it'll just swap right in (like on my Peugeot) sometimes it requires changing the spacers on the axle a bit and/or re-dishing the wheel. I would think a C-dale of that vintage has the dropout spacing to handle most 7-speed freewheels. Also, the long cage derailleur on your bike can handle cogs up to 34 teeth, so you might consider this an opportunity to get some big cogs in there, if you live in an area with challenging hills. The chain you linked to would work fine on your bike, as would as any 8-speed chain, too. The hoods you linked to are not right for your bike. You need some non-aero hoods for the brake levers. I think those are Shimano 600 (6207) levers but I'd need to see a more closeup shot. If so, that would date your bike to 1982-1985ish. Last edited by Lascauxcaveman; 03-28-15 at 10:11 PM. To my eye, the chain and freewheel look to be in great condition. Did they say why they wanted to change them? How's the shifting? Smooth or rough? Friction or indexed? That appears to be an STxxx from the 80s. Very cool bikes and have a lot of fans here. That is a good solid bike. Shimano 600 morphed into Ultegra in the late 80's early 90's, so also good stuff. This site might help you identify the make of your bike. Regarding your chain and freewheel, with more modern bikes it is often recommended to replace the cassette and chain at the same time, although I think that is bunk. 9,10,11 speed drive trains wear and become problematic faster due to tighter tolerances and lighter material, etc. There are different ways to measure a chain to determine wear but a worn chain won't gum up a 6 speed freewheel like you would see on a 10 speed. As mentioned above, if you're not having any problems with shifting or skipping, don't sweat it. If you google Sheldon Brown, you will find his website which has tons of awesome, practical info on bike maintenance. Well from the response I'm getting, it seems like I'm just looking for things to fix out of a want to work on something. The shop did admit i shouldn't really worry about it being how little of a distance i ride it, but its the next thing i should work on. I just have never ridden a bike with friction shifters, and its taking some getting used to. I feel like a new freewheel and chain would make things run smoother. The chain is too long/streched, and when I'm in the the highest gear it will rub against the derailer itself, they suggested i replace them both at once. I plan on ordering a chain breaker and may just take out a link or two to address that. So looks like ill wait on the freewheel and chain. One other thing i would like to do is replace the stem with something newer looking. I know its p art of the standard old school bike look, but i hate it. Is there a way to easily replace the stem with a modern one? Also as for checking the serial # to find the year, the plastic tab that the shifter cables slide on is covering it, oh well. So far everyone has been very helpful, so thank you. Last edited by Se7en 0 Se7en; 03-29-15 at 09:29 AM. Going back to your original post, I personally find the practice of shopping for cheap parts online and then asking a shop to install them a bit tacky. If you want to have a good relationship with the shop let them recommend the parts and buy them. You don't shop online for car parts and ask your mechanic to install them do you? If the chain is stretched and judging by the looks of the brake levers I would not be surprised if this bike does not need a full overhaul. You may not need new cables but I bet the bike would really benefit from some new grease in the bearings and wheels being trued. Even if it doesn't *need* new cables, they're cheap, easy-to-install without specialty tools, and the difference between a brand new cable and an old, stretchy cable is huge. Sure a cable is easy to install with out special tools if you already know how to do it. I would not order parts online, then ask a bike shop to install them. Bike shops are a business and provide parts/services to make a profit, which I suspect isn't much. It would be like bringing ink to a printing shop and asking them to print something for you. If you mean that while the chain is riding on the large cog, the top pulley is coming in contact with that cog, then the derailleur can't handle that large of a cog. Although, if it's close, adjusting the B-screw (or chain length) can sometimes dial that out. Last edited by Lascauxcaveman; 03-29-15 at 10:56 AM. Wow lots of help coming in, awesome. I'm about to head off to work but wanted to say thanks. As as for getting all the parts from the shop, yes, ill admit that's a bit tacky and ill reconsider that. Also both wheels were just trued in the last week or so. The brakes certainly aren't what I'm used to, being I've been using mechanic disks the last two years. I'm guessing that new cables would be a good idea, i would love more stopping power. That's an '85 ST 400 and it looks very original. Freewheel and chain look fine to me as well, post a picture with the chain on the big ring up front and one of the middle rings out back. Friction shifting takes a while to get used to, but you'll get the hang of it eventually. If you absolutely have to change the chain and freewheel for some reason, then use a newer HyperGlide (HG) freewheel- and 7 speeds should fit just fine- and a KMC 8 speed chain with a master link. Total cost for those two items is around $32 delivered to your home, while you're at it buy the correct freewheel removal tool and do it all yourself. Shifting will improve somewhat with the HG freewheel. But, if it were me and I wanted to actually upgrade my ride, I'd buy really good tires like Panaracer Pasela TG's and new tubes, a new set of brake pads, stainless Shimano brake and derailleur cables, and Jagwire housing. If you think it's a nice bike now, do all that and you'll be astounded. New cables don't really translate into better stopping power but smoother action, unless the cables are corroded and binding. 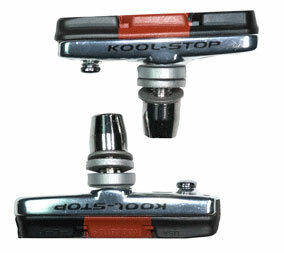 New brake pads like Kool Stop's dual compound 'Cross pad would make a difference as will cleaning the rim with some rubbing alcohol. Chains don't actually stretch, it's just a term used for wear. The rollers wear and the chain elongates slightly. It wouldn't wear enough to cause it to rub against the derailleur. I'm not saying the chain is not worn, but it's also at least a link too long. You will need a special tool to replace the freewheel, a chain tool, and replacement pins or master link if you're just going to shorten the chain. Bring it to your LBS and let them get the parts for you. Some shops charge extra if you bring them your own parts to put on just like an auto mechanic. Replacement parts for a bike as old as yours are not that expensive through a shop. Do you know if the chain has been replaced? maybe the chain is too long because someone replaced it, and didn't shorten it to the correct length. New/replacement chains are supplied long so they can be shortened to the correct length by the person installing the chain. You can check the chain wear yourself with a 12 inch ruler or tape measure. If the chain is not worn-out, then check to see if the chain is too long and needs to be shortened to work properly. I'd recommend buying a shop size chain breaker and a master link chain tool to make it easier to remove and replace master links from the chain. I don't know if many people noticed, but your bike has a triple crank, and a long cage rear derailleur. That combination has the ability to take up a lot of chain, and you have a nice wide gear ratio. Changing to a rear freewheel or cassette that has more gears will get you gears that will be closer together between gear, BUT you will still have the same top and bottom gear ratios. If you were to change the number of gears in the rear, and you wanted to change to indexed shifting, you would need to buy new shifters, and quite possibly new derailleurs. If you are itching to do something on the bike, why don't you start by getting the tools that are necessary to service the wheel bearings, bottom bracket, and headset. That would normally be cone wrench/es for servicing the wheel bearings, headset wrenches for servicing the headset, and bottom bracket wrenches to remove and adjust the removable cup on the bottom bracket. When you clean and inspect the wheel bearings you might find that the cones or cups are damaged or worn-out. That would answer the question you asked about replacing the freewheel (I would replace the old rear wheel and freewheel with rear wheel that has a freehub and uses a cassette (a good time to move to a 7 or 8 speed cassette). If the bottom bracket is damaged or worn-out you could choose another cup and cone bottom bracket or modernize with a seal cartridge bottom bracket. I don't see any advantage in a threadless headset and fork over a threaded fork and headset. The older design makes it easier customize the bike's fit for the individual rider. With threadless handlebar stems, your only choice for height are right side up, upside down, or buy another handlebar stem. The threadless handlebar stem adapters look strange to me. But the adapter so you can buy a threadless handlebar stem and buy a new set of handlebars? What's that going to cost you $100-$150? What will you gain? You're lucky to have a classic Cannondale for your first road bike. Make sure the tires are good, the bearings are lubricated and adjusted, and the brakes work. Then go ride. Ride a lot. After you ride a lot, you'll be able to tell what needs updating and what needs upgrading. You may find that you prefer the bike the way it is, or you may find that you need a different bike to ride the way you want to. Last edited by RoadGuy; 03-29-15 at 11:43 PM. Post your location city and state. Folks here are so nice you just might find some experienced old wog here that lives near you and would help you out in person for a nice cuppa-n-donut or a long neck bottle. I would if'n you were near me. Each one teach one. Or someone will recommend a great C&V shop they know of that will give you good advice, good service and not just throw parts on it at your expense.